Welcome Home to this fabulous STUDIO condo with CARPORT. This studio boosts a FULL-SIZE Kitchen with breakfast bar and lots of closet space plus features updated Hurricane WINDOWS and SHUTTERS, appliances, bathroom vanity, toilet and much more. Comes fully furnished with Murphy Bed and nicely decorated as a beach cottage getaway!! Enjoy beautiful Western view of the GULF of MEXICO, Intracoastal Waterway, Lagoon and complex just a little piece of HEAVEN right here at Sea Towers. 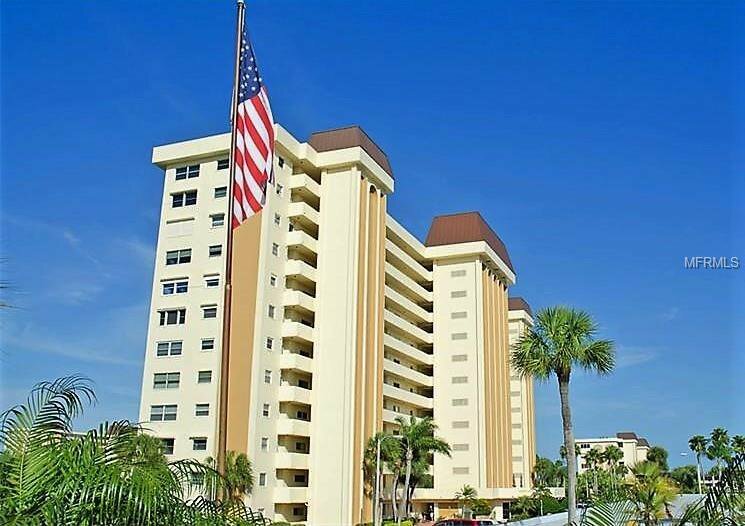 Wonderful Community here at SEA TOWERS: This great waterfront community, 55+ community offers fantastic amenities - two heated pools; tennis courts; fishing piers; shuffleboard courts; a putting green; a fitness center; sauna; and much more! There's even a full-time social director whose mission is to fill your calendar with exciting activities on-site, in and around St. Petersburg, and beyond. Access to the beaches, nearby restaurants, shopping, and entertainment plus close to the bus line which makes this the perfect place to live! Call today to see this lovely unit! Listing courtesy of FUTURE HOME REALTY INC. Selling Office: KELLER WILLIAMS ST PETE REALTY.